These Are the Most & Least Stressed States in the U.S. Stress is everywhere, and nothing quells those overwhelming feelings quite like talking about them. The fact of the matter is that depending where you live, you may be experiencing higher levels of stress than most. April is National Stress Awareness Month, and in celebration of that, WalletHub just released its annual study on the most and least stressed out states in America. If you’re from Louisiana, you might want to stop reading now and go meditate or something. You’ve been through enough. While you might associate states with big bustling cities with high stress, the list proves that people all over are dealing with some pretty serious stuff. It’s not all about you, New York and California. In gathering its information, WalletHub compared all 50 states and DC across four key factors: Work-related stress, money-related stress, family related stress, and health and safety-related stress. It then evaluated those four stress components against 40 related metrics (things like personal bankruptcy rates and crime rates per capita) and graded them on a 100-point scale. The average of those findings became the overall score, which was ranked alongside the other states. Check out this (shown below) map from WalletHub, which shows where each state fell in the rankings. You can hover over your state to see just how stressed out you and others around you really are, as if you don’t already have an idea. WalletHub’s map shows how stressed each state is using colors. The darker your state, the more stressed the people living there are. Southern states make up the top 10 for a second year in a row, with Louisiana topping the list once more. WalletHub found that people who live there average high hours worked in a week, high percentages of adults in fair or poor health, low credit scores, high divorce rates, lots of crime, and high percentages of people living in poverty. Is it any wonder people there are stressed out? Other extremely stressed states, like Alaska, Kentucky, Mississippi, and West Virginia ranked high in the same things. While some of the states ranked as the least stressed, like North Dakota and Hawaii, were among the places with the lowest job security, least number of hours slept per week, and least affordable housing, it seems the good outweighs the bad in these situations. Those low-stress states also boasted the lowest divorce rates, least number of people living in poverty, high credit scores, low numbers of adults in fair or bad health, and more. 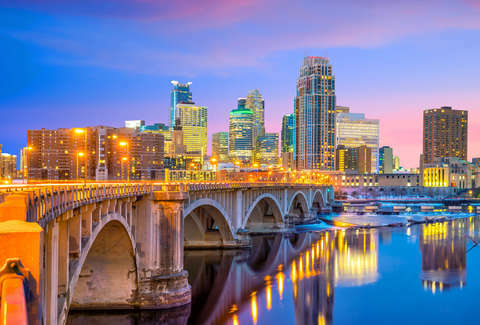 Minnesota, the least stressed state of them all, was ranked among the states with the healthiest people, highest credit scores, lowest divorce rates, and most psychologists per capita. The findings suggest there are some serious perks to living a stress-free life. Maybe it’s time to consider packing up and heading west, where the food's great, too.